Deep Meadow Correctional Center is a medium security prison located in State Farm Virginia. The facility houses approximately 850 adult males in five open bay dormitory housing units. Each of the five dormitories is divided into an A and B Unit, which each houses about 70-75 inmates. Deep Meadow Correctional Center is also responsible for the James River Work Center which houses an additional 278 inmates. Inmates at Deep Meadow Correctional Center have access to reentry programs that help re-establish the offender into the community upon release. The facility provides medical, dental and mental health care to all inmates. 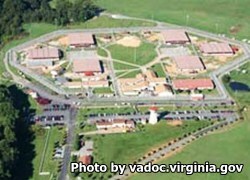 Deep Meadow Correctional Center also has a geriatric program for elderly offenders in the Virginia Department of Corrections. Academic and vocational courses are available to all inmates, and offenders who are at the James River Work Center can work on a farm caring for horses, planting and harvesting crops and caring for a herd of dairy cows. Visits at Deep Meadow Correctional Center are based on a rotating schedule and occur on Saturdays and Sundays. The visiting schedule rotates, you will need to contact the facility for the current visiting rotation.